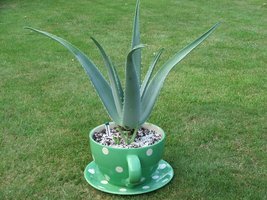 Aloe Vera Plants – they are truly amazing! Most people when looking at the Aloe Vera plants think they are a type of cactus. They certainly look like a cactus but are from the lily family, related to the onion, garlic, asparagus and tulip. There are over 400 species of Aloe Vera plants worldwide, yet only 5 are used by humans, the main one used for healing purposes being “Aloe Barbadensis Miller”. Medicine plant, Burn plant and Silent Healer are just three of a dozen or so nicknames used in different cultures throughout the world, and all fit the bill extremely well. 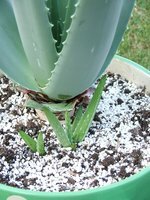 Aloes are semitropical succulent plants and indigenous to the African savanna. A good point to note as plants will thrive best in well-drained gritty soil, with watering kept to a minimum. They make very good house plants and having been introduced to Aloe Vera, I bought a small one, some 15cm tall. I didn’t really know much about looking after one, but can it be that difficult? Within a couple of months I found the leaves on my plant going brown. They were soft and spongy, all of the firmness gone, in spite of occasional feed and little water. What could or should I do? As with most people the Internet was my first port of call. Although I had to search through many sites, I finally found some information on how to give my plant ‘the kiss of life’. The plant was pot bound, strangling itself, just needed a bit more room. Lucky for me there was a largish (26cm) ‘cup and saucer’ plant-pot sitting gathering dust. I used a mix of garden soil, sand and multi-purpose compost with a few stones in the bottom of the cup for drainage. To finish I used 1.5 litres of water with a measure ‘Miracle Grow’. Fast-forward a month and what an amazing transformation. The brown ends had all but disappeared, the leaves firm again and to top it all, new growth at the centre. 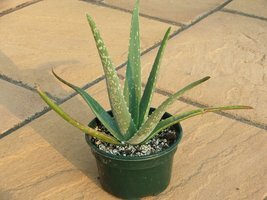 An Aloe plant should be allowed to completely dry prior to re-watering/feeding. They are susceptible to frost and will not survive below 5 degrees centigrade. Ensure they get as much light, not direct sunlight, as possible. Over the winter I took the above advice and by the end the plant was outgrowing our kitchen table. It measured 82cm diameter and 50cm in height so I had to cut some leaves off a reduce the measurements to 65cm x 50cm. Before trimming I removed a 'pup’ and both plants suffered. I didn't get the composition correct and found they both had soaking wet roots. Yet another transplant and this time I added perlite for extra drainage. I left both plants totally dry for two weeks. This is what can be achieved. The main plant now has more pups(3 although only two can be seen). The original pup now measures 33cm x 23cm. To view and purchase a complete Aloe Vera product range please Click here link (opens a new page).